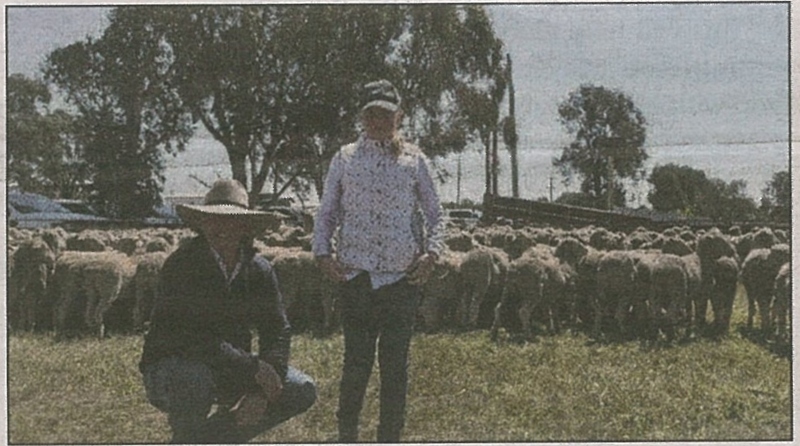 Stephen & Lily Huggins, “Eurolie”, Hay, with their 407 April/May ’16 drop, August-shorn, Woodpark Poll-blood and Eurolie-bred ewes which sold for $226. Restockers were out in force during the 15th annual John Wells Memorial store sheep sale at Jerilderie. Top price at $252 was paid to Hugh and Heather Cameron, “The Yanko”, Jerilderie, for their pen of 434 May/June 2016 drop ewes, September-shorn and The Yanko-blood when bought by producers from Bendigo, Vic. Vendor Ross Wells, Willandra Merinos, said “It is one of the strongest sales I have seen for a long time”. Other excellent prices included $240 for 351 June/July 2016 drop, August shorn and Woodpark Poll-blood sold on account Donald and Ann Bull, “Irroy”, Deniliquin and $230 for 428 April/May 2016 drop August-shorn and Willandra-blood sold on account Sleigh Pastoral Co, “Kooringal”, Jerilderie. 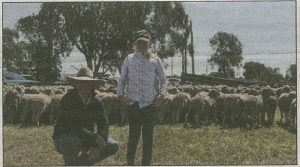 Stephen and Carol Huggins, “Eurolie”, Hay sold 407 April/May 2016 drop, August-shorn and Woodpark Poll-blood for $226 while Ross Wells, “Willandra”, Jerilderie sold 252 May/June 2016 drop, August-shorn ewes for $220. Buyers attended from central and southern Victorian districts, Wagga Wagga, Lockhart, Forbes, Narrandera, Lake Cargelligo, Hay, Deniliquin and Finley. The sale was conducted by Elders, Jerilderie.